Sometimes you just have to lighten things up, y'know? As if the jokes-as-philosophy book wasn't light enough.There have been quite a few spin-off books from Pratchett's Discworld series in the years that he's been doing them. Various maps, the Science of Discworld books, plays, films and now this. And I think we can all agree that spin-offs are never quite as good as the original.Oh sure, there are laughs to be had - it is Nanny Ogg, after all. If you don't know who she is, then you need to go through a few of the books in the Witches track of the Discworld series. If you don't have time for that, then let me sum it up for you.In the mountaintop village of Lancre, people still do things in the old ways. They have no real need for modern contrivances or newfangled ideas or, well, change. So in that way, they still see the need for witches where the rest of the world has decided that they're really nothing but interfering old biddies. Of course, they would never say so to their faces....Lancre is the home to three witches. At least, there used to be three. One of them decided to trade it in to be a queen, leaving the elder witches to look after Lancre on their own. Granny Weatherwax is the elder of the two witches, and she is everything you expect in a witch. She's hard as nails, brooks no nonsense, and is the scariest thing in the mountains. She lives alone in her isolated shack, and takes great pride in people knowing that she was one of those people who didn't care what people thought.At her side is the more amiable, but no less powerful, Nanny Ogg. She's usually described as having a face like an apple left in the sun for too long. Unlike Granny, she's a matriarch, the head of a vast family of Oggs, and lives among the people. 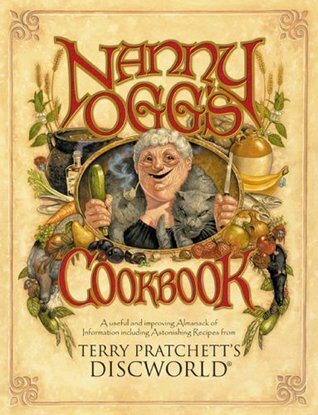 She has an infectious laugh, chats on and on, and is always ready to try new things.So, of the two, Nanny Ogg is the one who would naturally want to write a book.It's a cookbook, certainly, and contains a great many recipes. I may try some of them sometime, actually, as they are real recipes. The fictitious publishers take great pains to remind us that many of the original ingredients are either inedible or offensive, so while the dishes contained therein many not be authentic, they at least will probably not cause you any discomfort. The recipe I am most eager to try out is Mrs. Whitlow's Artery-Hardening Hogswatch Pie, although the Patrician's recipe for bread and water is tempting, as is Leonard of Quirm's method of making a cheese sandwich.There is a back half of the book as well, dealing mostly in the realm of etiquette and proper behavior. It's very amusing, and covers every situation from weddings to birth to death to visitations by semi-sentient scarecrows. What you really take away from it is that you should certainly be polite to everyone, and you should be especially polite to any witches you might come across. If you know what's good for you, anyway.I will be the first to admit that I'm a huge fan of Pratchett and his Discworld, but there are bigger fans than myself, and it is really for those people that this book was written. For some readers, the original books will never be enough, and they will clamor for any additional content to make the world they love more real. Thus things like the Harry Potter spin-off books, the Dark Tower companion books, and the various additional Discworld texts. If the original books were deficient in some way, if they added extra depth and substance to the characters, then I would collect them all.But this book doesn't really add anything to the Discworld because that world is already vivid and deep, a living world that the novels have brought to life over the last 25 years. I don't need a recipe book to tell me more about Nanny Ogg, and this recipe book doesn't tell me anything about Nanny Ogg - or any other Discworld characters - that I didn't already know.This book is an entertaining gimmick, and I hope that the rabid fans who love this kind of thing have found it to be the kind of thing that they like, to paraphrase Lincoln. But it doesn't inspire me to buy any more non-novel Discworld books. But that's just me. I would say a "Must Have" for any Discworld fanatic, but unfortunately it's not a "Must Have"... what it is however is a very fun, whimsical cookbook assembled by our favorite dirty minded witch of Lancre - Nanny Ogg. Though this book does contain recipes (and most of them appear fairly legit) the reason to buy this book is for the old fashioned wisdom that used to come in cookbooks. The more of the Discworld books that you have read, the more you will recognize the names and people mentioned in the recipes. Everyone from the Patrician, to Nobby's Mum, to The King of Lancre have contributed their favorites (Even CMOT Dibbler has contributed his "Sausage-inna-bun recipe). There are also a series of "Ethnic" foods from Klatch, Quirm, Lancre, and many other of the Discworld lands including multiple Dwarven recipes which (include the ever popular "Dwarf Bread.") Throughout the cookbook you will find not only recipes, but also Nanny's quips, and advise, as well as notes from the "editors" who are very concerned about Nanny's tendency towards the vulgar. It is safe to have around the house because the kiddies won't get the references as Nanny always states them with double meaning and a wink. At the end of the book there is a section on life and etiquette which is absolutely hysterical. Having just been married two years ago, the section on weddings nearly had me in tears, specifically the instructional part about how to have the obligatory wedding fight among the guests. Note to those of you wavering about the purchase of this book. It's cute, it's funny, but it is by no means a novel. If you plan to sit down with it and read it as a book, you will be done in less than an hour and will probably be disappointed. If you are the type who has a few "Discworld junkie" friends, this is the perfect help to any party... you can all get together and make dwarf bread and see who's flies the farthest. This would also make an excellent gift for a Discworld fan. If you are planning to put it in your kitchen with the rest of your cookbooks, I would advise getting the hardcover version. OMG! This needs to be rated PG-17 -- Strawberry Wobbler?!?! If I made this dish, my husband would have a stroke. This is Nanny Ogg at her naughty best, with apoplectic notes from the editor and the publisher. I sniggered and snerked all the way through. Леля Ог си е леля Ог.. дори и "редакторите" едвам успяват да я усмирят и да цензурират част от по-пикантните съвети. Разбира се, от всяка вещица има какво да се научи, но тя за разлика от баба Вихронрав например, е и глава на огромно семейство, така че може да се похвали с доста повече опит в... хм, някои сфери на живота. Смехът е гарантиран, удоволствието също.. за ядивността на рецептите нищо не мога да кажа, защото не съм се престрашила да ги пробвам. Предполагам, че за да се наслади максимално на книжлето обаче, би трябвало човек да е прочел поне няколко книги от серията за вещиците от Света на Диска и да е запознат с основни герои и събития.ПП: Не мога да скрия разочарованието си, че в раздела за етикецията и по-специално празненствата, не намерих извадки от популярни песни като "Таралежът никогаш не мож го избъзика". Вероятно е била трезва, когато се е занимавала с писане. Delightful. Some of the food even appears to be edible. Interesting recipes and wickedly funny anecdotes with discworld's best. There are several reasons why I love this book. 1. It's a first person perspective of one of my favourite Pratchett characters, Gytha 'Nanny' Ogg. A bawdy, friendly, matriarchal figure who is just beautifully written for. 2. Many of the recipes are provided by other Discworld characters and gives a little additional background and insight into these people, which might otherwise seem a little superfluous shared in the novels themselves. 3. It's a cookbook, so there are actually some decent recipes in there. A few of them are 'adapted' from the original Discworld recipes due to the shortage of certain native ingredients on boring, old Earth. And also certain physical laws which tend to be a teensy-bit more malleable on Discworld. 4. The illustrations provided by Paul Kidby - http://www.paulkidby.com/ - are just wonderful. He's the second official illustrator for the Discworld novels after the passing of Josh Kirby, and there is one particular illustration of a man/rambler meeting a troll for the first time and offering his hand (an insult about the troll's mother in the physical language of the trolls) that just cracks me up every time I see it. There are lots and lots of lovely little touches that you pick up on having read the Discworld series, but it would also be a nice gentle introduction to the humour and characterisations if you have never read any of the books before. If this book doesn't raise a little chuckle or two as you read through it, I would be very surprised. There are recipes in this book, but I don't know if the food's actually edible. I think so, though. The recipes are, however, not the reason why I bought Nanny Ogg's Cookbook. I bought it because I love Nanny Ogg. She's one of my favourite characters, not just from the Discworld novels, but all in all. The book is filled with little tips based on her wisdom of life. And boose. And men. We also gets some information about the undead: "At first glance this appears very simple. Nearly everyone you meet is 'undead'. That's why they're called alive. But infact we're talkin' about people who ought to be dead but ain't." Zombies, for example:"They're dead, but they wont lie down [. . .] It is not good manners to make cutting remarks like 'Isn't there something you be doing? Like lying down?' and certainly not 'Decompose yourself.' "The book remains true to the Discworld style, and I really enjoyed it. A bonus is that it's filled with Paul Kidby's illustrations, which I love. Not only a great read...but has some legitimately tasty recipes included. I mainly bought the book because, well. Because I but EVERY T Pratchett book. Figured it would be an entertaining read, and honestly only made the first recipe as a way to kill a rainy afternoon.Shockingly, while they aren't going to end up on a 4-star menu, there ARE some really tasty recipes to pick from. I now own 2 copies - one to read, and one that is starting to look a bit battered from various culinary splashes. Much obliged for an authoritative explanation of roast figgins. Must try the recipes for Sergeant Angua's vegetable stew and that Unseen University faculty favorite, Wow Wow sauce (first locating a thaumatologically inert glass bottle and stopper, of course). Etiquette tips on how to entertain duchesses, witches, and that gentleman who drops weasels down his trousers for a living should come in handy! Recomendado para los muy fans de Pratchett y del Mundodisco.Las recetas son geniales y algunas hasta parecen comestibles y todo (excepto las recetas de los enanos -_-)En la segunda parte del libro, Tata da un sinfín de consejos de etiqueta para múltiples ocasiones y de como comportarse con todas las criaturas del Mundodisco. Много мила и топла книжка за доброто старо време. Бих се престрашила да опитам някоя рецепта, макар че съм голям карък в кухнята.Може би някой ден...Не съжалявам, че малко подраних с нея (понеже трябва да си прочел още някоя и друга книжка за Света на Диска, за да си напълно наясно с напълно всички герои, които така отдадено са предложили своите рецепти). A funny book with some recipes I'm definitely going to try. I liked how there were some famous Discworld characters mentioned in this book, like Vetinari and Rincewind. Very enjoyable read if you like discworld novels. I am suspicious of the recipes and wonder if anyone has ever tried them. A fun book, with lots of special guest recipes by various Discworld characters. Some of the voices aren't quite up to Sir Terry's level, but it's still good fun. I just started reading the Discworld series and I'm enjoying it so much I had to get this cookbook to immerse myself into the world. Hilariously funny humour and anecdotes as well as some good advice with a chuckle. Some of the recipes are naughty but actually sound like they'd taste pretty good. It's all in the aaaaa..... presentation. Need to do some conversions though since it is from the UK and is in metrics. The strawberry wobbler will need a modified presentation if you're going to serve it to the kids! Look forward to making some of them soon! This is the first and only book I've read about Discworld and so I should not judge the series or the author from just this. But it really was not all the that good. A book of recipes by the character, Nanny Ogg. It also expounded on other traditions of Discworld. I might have to read something from that series before judging this book as only being ok.
Typický pratchettovský humor. Skvelá knižka, v ktorej nie sú len recepty, ale aj dobré rady do života podané nenahraditeľným štýlom stařenky Oggové, ktorá vie čo a ako. Toto je ďalšia z tých bonusových kníh, ktorú by si mal zadovážiť, každý fanúšik zeměplochy a, keď nadíde čas, aj skúsiť niektorý z preslávnych receptov stařenky Oggové. Amusing, but I wouldn’t recommend it for anyone who is not already a Discworld fan. Ty recepty jsem si tak úplně neužila, myslím, že na mnohé z nich jsem ještě příliš mladá. Zbytek knihy je však plný mouder a poměrně vtipný. Bohužel nejzajímavější pasáže jsou cenzurované. This book combines two amazing things, Terry Pratchett's beloved witch and cooking. 4.25 stars is probably a better rating but this will have to do. I laughed and enjoyed this cookery book. Terry Pratchett Stephen Briggs Tina Hannan Paul Kidby - Sir Terry Pratchett sold his first story when he was thirteen, which earned him enough money to buy a second-hand typewriter. His first novel, a humorous fantasy entitled The Carpet People, appeared in 1971 from the publisher Colin Smythe. Terry worked for many years as a journalist and press officer, writing in his spare time and publishing a number of novels, including his first Discworld novel, The Color of Magic, in 1983. In 1987, he turned to writing full time. There are over 40 books in the Discworld series, of which four are written for children. The first of these, The Amazing Maurice and His Educated Rodents, won the Carnegie Medal. A non-Discworld book, Good Omens, his 1990 collaboration with Neil Gaiman, has been a longtime bestseller and was reissued in hardcover by William Morrow in early 2006 (it is also available as a mass market paperback - Harper Torch, 2006 - and trade paperback - Harper Paperbacks, 2006). In 2008, Harper Children's published Terry's standalone non-Discworld YA novel, Nation. Terry published Snuff in October 2011. Regarded as one of the most significant contemporary English-language satirists, Pratchett has won numerous literary awards, was named an Officer of the British Empire “for services to literature” in 1998, and has received honorary doctorates from the University of Warwick in 1999, the University of Portsmouth in 2001, the University of Bath in 2003, the University of Bristol in 2004, Buckinghamshire New University in 2008, the University of Dublin in 2008, Bradford University in 2009, the University of Winchester in 2009, and The Open University in 2013 for his contribution to Public Service.In Dec. of 2007, Pratchett disclosed that he had been diagnosed with Alzheimer's disease. On 18 Feb, 2009, he was knighted by Queen Elizabeth II.He was awarded the World Fantasy Life Achievement Award in 2010.Sir Terry Pratchett passed away on 12th March 2015.